A couple of years ago, A.V. Club editor Keith Phipps purchased a large box containing more than 75 vintage science-fiction, crime, and adventure paperbacks. He is reading all of them. This is book number 71. James Bond is dead. Or so it would seem at the outset of The Man With The Golden Gun, Ian Fleming’s final James Bond novel. (If it counts as a Fleming entry, that is. More on that below.) After he disappeared at the end of You Only Live Twice, the world thinks he’s an ex-007. Yet there he is showing up for duty at the opening of the novel, asking to see M as if nothing had happened, but not quite seeming himself. What’s going on? I’m not exactly sure. 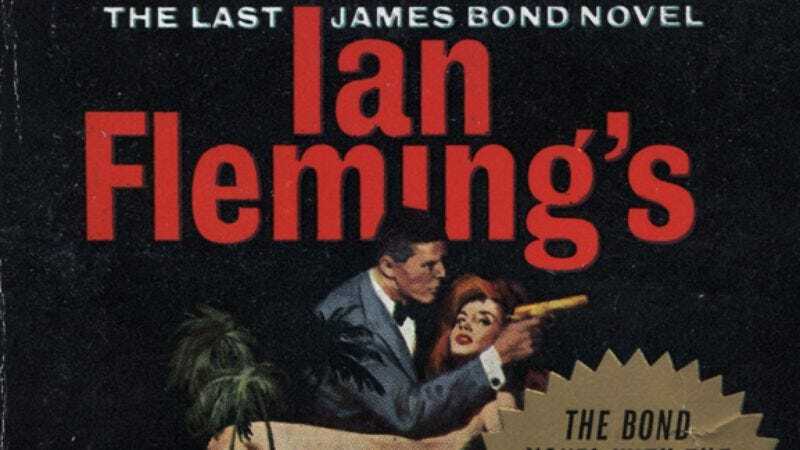 The Box Of Paperbacks has been generous in providing Ian Fleming’s original Bond novels—there are even a couple of miscellaneous Bond and Fleming items still to come—but it skipped a couple, providing neither The Spy Who Loved Me nor You Only Live Twice. But it isn’t hard to put two and two together. Having fallen into the hands of the Russians, Bond has been subjected to some Manchurian Candidate treatment and sent back home to take out M. It’s a clever notion, modified and recycled in the opening of 2002’s Die Another Day, Pierce Brosnan’s final outing as Bond. (It has a thrilling opening, but quickly turns into one of the worst of the recent Bond movies.) Unfortunately, all that brainwashing seems to have made Bond a much duller character than ever before. Gone are the glimpses of Bond’s increasingly tortured psyche. Gone, even, are elaborate discussions of his consumption habits. Instead, we’re left with a fairly flat adventurer who wouldn’t be out of place in a lesser novelist’s adventure tale, but doesn’t seem much like Bond. He even takes on a generic adventurer’s nom de action for much of the novel: Mark Hazard, a name better suited to a long-running, little-read daily comic strip than an iconic super-spy. a) Fleming finished The Man With The Golden Gun but hoped to rework it. b) Fleming finished The Man With The Golden Gun but his editor, William Plomer, polished it. c) Fleming didn’t finish The Man With The Golden Gun, but vocal Bond admirer Kingsley Amis—who definitely wrote the first post-Fleming Bond novel, Colonel Sun, published in 1968 under the name Robert Markham—did. Of the above, the first seems best supported by empirical evidence. But here’s something that’s tough to deny: If The Man With The Golden Gun felt of a piece with Fleming’s other Bond novels, no one would question its authenticity. Not that it’s terrible, mind you. It’s a breezy read highlighted by descriptions of Fleming’s home-away-from-home Jamaica as it struggles with its post-colonial identity. (Not that Fleming is necessarily rooting for it to find a post-colonial identity. Bond speaks of it condescendingly, and every element of the old Jamaica he encounters makes him nostalgic for the time before.) But the adventure itself is weirdly straightforward, yet still a little farfetched even by Bond standards: Bond is sent to kill the eponymous villain, a man named Scaramanga, but finds him presiding over a society of villains that includes commies and assorted Mafiosi. (Why not throw in some orcs and Old West bandits to fill out the rogues’ gallery?) Old supporting characters have a habit of turning up, too, including Bond’s desirable former secretary Mary Goodnight, and the mangled-but-forever-resilient CIA agent Felix Leiter. Some moments are unmistakably Fleming’s, however. Bond has grown more nuanced, and more troubled by his adventures, throughout the series. But he still views the world as his to consume, from its food to its women. About halfway through, Bond joins Scaramanga and the other villains as they take in a vividly described floorshow, highlighted by a woman with “Chinese blood in her” writhing atop a huge hand upholstered in black leather. It’s a completely gratuitous moment—one I’m guessing was inspired by a real spectacle at the time—and I’ll replicate its gratuitousness by sharing a highlight here for no good reason but my own amusement. Shall we? She jerked round the hand she caressed its outstretched fingers with her hands and arms and then, with well-acted swooning motions, climbed into the palm of the hand and proceeded to perform languorous, but explicit and ingenious, acts of passion with each finger in turn. The scene, the black hand, now shining with her oil and seeming to clutch at the squirming white body was of an incredible lewdness, and Bond, himself aroused, noticed that even Scaramanga was watching with rapt attention, his eyes narrow slits. The drummer had now worked up to his crescendo. The girl, in well-simulated ecstasy, mounted the thumb, slowly expired upon it, and then, with a last grind of her rump, slid down it and vanished through the exit. The act was over. Okay, that isn’t entirely gratuitous. Throughout the book, Fleming teases the notion that Scaramanga doubles as a dark mirror image of Bond. He has a vastly different origin story—something ridiculous involving the death of a beloved elephant—but the two proceed through life in much the same way. They take what they want—that performer ends up in Scaramanga’s bed—and kill those who get in the way. But only one of them is a state-sanctioned agent ostensibly on the side of the angels. Unfortunately, like much of the book, the parallel has been sketched in pencil. Maybe had Fleming taken another pass, Gun would feel like a proper continuation of the series, instead of like an epilogue. I doubt Fleming ever had a master plan for his most famous creation, but he had an unmistakable way of handling his hero, perpetually underscoring his globetrotting adventures with notes of melancholy. Casino Royale, the first Bond novel, refers to the hero as a blunt instrument. Fleming’s books never question the necessity of the instrument or the rightness of the institution wielding it, but they never lose sight of the fact that serving as an instrument—even one who gets to dine well, drink to excess, and bed an absurd number of women—comes at a cost. Bond didn’t die at the end of You Only Live Twice. He’s had a long life after his creator’s death. But a certain aspect of Bond passed with Fleming, a spirit that’s never entirely recovered. He lived well but he suffered for it, becoming a restless spirit doomed to travel alone. He ends this novel in the arms of Mary Goodnight, but aware that he’ll soon be moving on, that “the same view would always pall.” Is his existence enviable, or a sort of living death? I think much of the character’s allure on the page—and in fleeting moments in the best films—comes from Fleming’s unwillingness to supply the answer. I don’t think he took the answer with him, either. I don’t think he knew. "Back to back, Kor and Atlan of the Forests fought the Green Ones." / "The ship was ready."